Ma Sharda International is a well known name in the female & kids apparel business. We are known in the market as a manufacturer and supplier of finest quality female & kids garments that have universal appeal. There are numerous garments exporters, garments manufacturers, readymade garments exporters etc. Our commitment to customers is to offer them hi-fashion garments that conform to the latest fashion trends and incorporate innovations and creativity of our skilled people. garments industry in India is one of the best in the world. There are numerous garments exporters, garments manufacturers, readymade garments exporters etc.. The Evening Gowns are primarily made from silk, chiffon, velvet, polyester & nylon satin, that gives an elegant and floating appearance to the gown. These highly refined fabrics impart them with smooth and tender feel. The gowns are transfused with gentle colors for pleasing and gracious look. 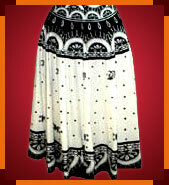 The Printed Skirts come in several designs like pleats, flounced ruffles, seamless ruching, etc. The fabrics used include lycra, chiffon, cotton, silk, satin, etc. These Printed Skirts can refashion anybody's wardrobe by eliminating the drab and dull clothes. These skirts are available in colorful patterns and exciting designs. 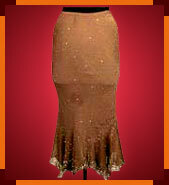 The Skirts are available in large verities of fabrics like cotton, silk, satin, etc. Our skirts are known for their casual sophistication. They are stylish, fashionable and in sync with contemporary dressing sense. 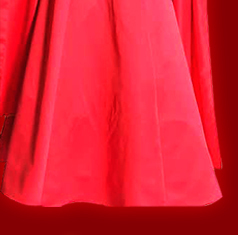 The fully lined skirts sit conveniently on the waist and are very comfortable to wear. 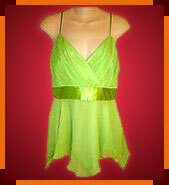 The top with handkerchief bottom are made with fabrics like silk, cotton, nylon, polyester, spandex, etc. Halter ties extend from the pin to the back of the neck and can be tied according to the best fit. The Plain Crochet Jackets are using widely popular which were made by hand & machine in cotton & acrylic thread, In some jackets the lightweight cotton voile lining to be used. 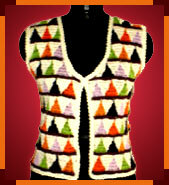 The crocheted designs in which these jackets are available include varying necklines, interesting collar patterns etc. 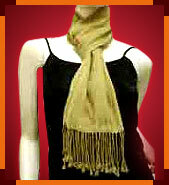 We manufacture scarves using all kinds of fabrics that include wool, rayon, silk, acrylic, polyester, cotton, nylon, etc. They are available in different shapes with rolled, hemmed or tasseled edges. They bequeath warmth and sophistication to the wearer. Our extensive collection includes woven, knitted etc. 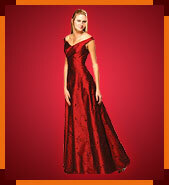 The party gowns are made from highly treated mixed fabrics like silk, polyester, chiffon, satin, velvet, etc. They are available in different designs ranging from fitted bodice halter to deep 'V' neckline that continues through hips and falls seamlessly to the ground. These skirts are embellished with colorful gorgeous sequins and beads in all sorts of fabrics like lycra, chiffon, cotton, silk, satin, etc. 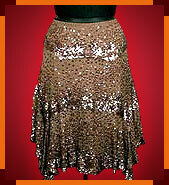 We utilize multicolor sequins that shine and shimmer to give the skirts romantic and luminous look. 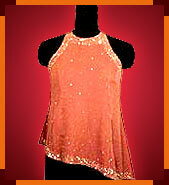 The sequins are meticulously placed over beautiful designs. Ladies Tops are manufactured primarily using pure cotton fabrics that are extremely comfortable to wear. 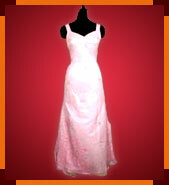 They are also available in silk georgette, satin, chiffon, etc. 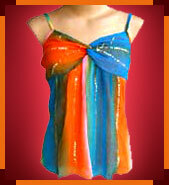 The Tops we manufacture follow the designs that are in vogue as well as innovative patterns. We use various types of Beads that include cut beads, seed bead, faceted bead and rounded bead of different colors and finishes. We hand-pick finest quality beads that radiates right kind of sparkle which blend well with the color and design patterns embossed on the tops. 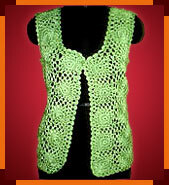 The Crochet Jackets are made from Cotton & acrylic thread and in some varieties of wool. They are available in different crocheted designs that include interesting neckline, collar patterns and open front Cardigan with an optional matching tie at the waist. These jackets can be worn atop any dress. 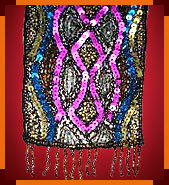 We manufacture Sequin Scarves of assorted patterns on different fabrics which include silk, cotton, polyester, rayon, acrylic, nylon, wool, cashmere, lace, etc. The sparkling Sequins are embellished on eye-catching designs that instantly grab the attention of the onlooker.